Such a form of leadership is common in communist states in which the length of one's service to the party is held to be the main qualification for leadership. In the time of the Eight Immortals of Communist Party of China, it was quipped, "the 80-year-olds are calling meetings of 70-year-olds to decide which 60-year-olds should retire". For instance, Party leader Mao Zedong was 82 when he died, while Deng Xiaoping retained a powerful influence until he was nearly 90. Other Communist countries with leaders in their 70s or 80s have included Vasil Mzhavanadze was 70 when forced out, and his Lithuanian counterpart Antanas Sniečkus was 71 at death. Nowadays, Cuba has been characterized as a gerontocracy: "Although the population is now mainly black or mulatto and young, its rulers form a mainly white gerontocracy." 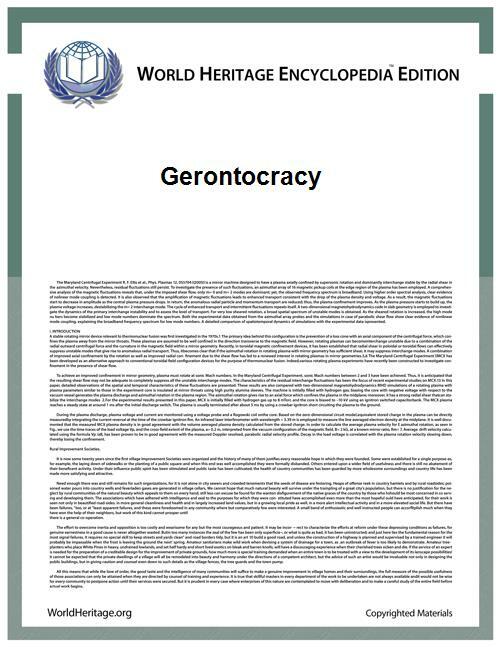 Gerontocracy is also common in religious Iran, The Vatican and The Church of Jesus Christ of Latter-day Saints, in which leadership is concentrated in the hands of religious elders. Despite the age of the senior religious leaders, however, parliamentary candidates in Iran must be under 75. Historically, it could be argued that 1950s Ireland was a gerontocracy. Due to high levels of emigration of young adults, there was a disproportionately high amount of elderly people remaining in Ireland. The relatively social conservative nature of Irish politics (compared to other Western democracies) has been attributed to this lack of young adults at the time, along with politics being divided along Irish Civil War lines instead of between left-wing politics and right-wing politics. Present-day Italy is often considered a gerontocracy, even in the internal Italian debate. The Monti government had the highest average age in the western world (64 years), with its youngest members being 57. Former Italian prime minister Carlo Azeglio Ciampi were 89 and 86 respectively. In 2013, the youngest among the candidates for prime minister (Pier Luigi Bersani) was 62, the others being 70 and 78. The current average age of Italian university professors is 63, of bank directors and CEOs 67, of members of parliament 56, of labor union representatives 59. On the other hand, gerontocracy may emerge in an institution not initially known for it. The Latter Day Saint movement founded by Joseph Smith, a 24-year-old man, who in 1835 constituted the first Quorum of the Twelve Apostles with members ranging in age from 23 to 35. After the death of Smith, it was established in The Church of Jesus Christ of Latter-day Saints (LDS Church) that succession to the church presidency derived from longest tenure in an office held for life, the hierarchy aged markedly, and with the growth of the church the age at which officials were named to the highest bodies continued to rise. Six church presidents have held office past the age of 90. In the biblical figure, they control most of the economic and political activities of the planet. Several Meths play a major role in the first novel, Altered Carbon.